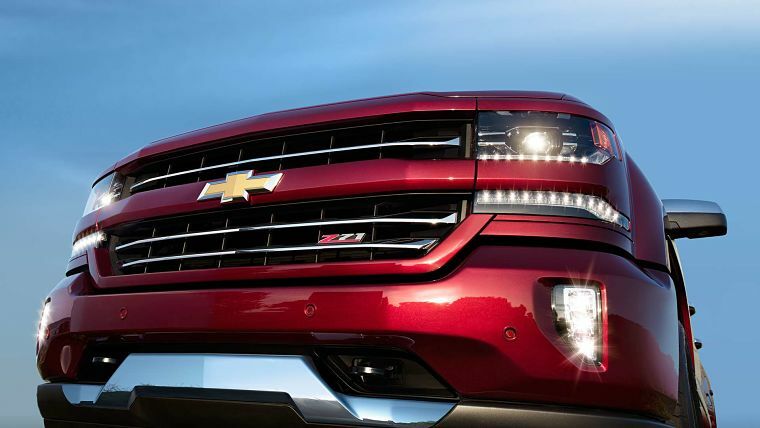 The Silverado is a higher-end pickup by Chevy with a long list of trim levels and a very high value. For 2017, the Silverado gains a few more safety features, and some features exclusive to packages were made standard. 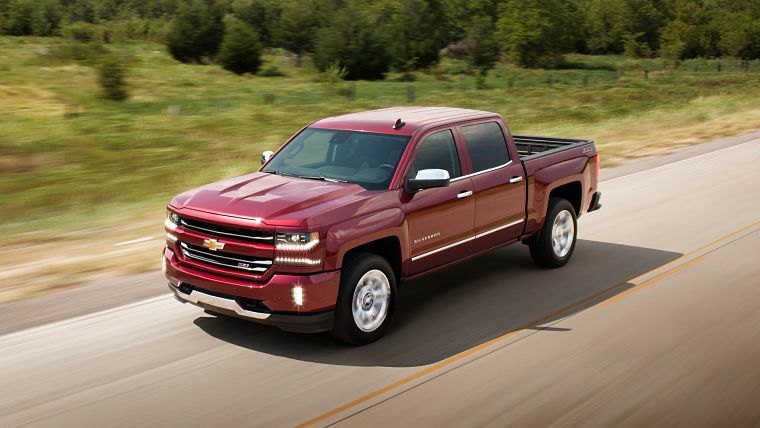 If you’ve been interested in the capable and adaptable Silverado in the past, give the latest 1500 truck a test drive. There are seven trim levels for the 2017 Silverado 1500: the WT, LS, LT, LT Z71, LTZ, LTZ Z71, and High Country. 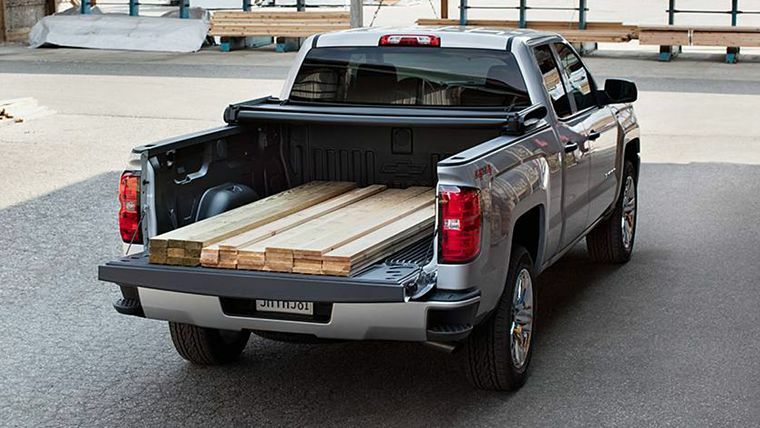 The Silverado can also be customized with a regular, double, or crew cab style and a short, standard, or long bed. Short beds are only available with the crew cab style. New for all trim levels is a capless fuel system, while trims above the WT include Onstar guidance, leather bucket seats, advanced safety technology, and much more. Choice is always useful to buyers, and the Silverado offers more trims and options than most trucks in its class. The Silverado maintains the square, confident, and angular appearance of its 2016 version, and has two new colors: Graphite and Pepperdust. Drivers who opt for the standard WT will get 17-inch painted steel wheels. As for updates, the LT trim level has new optional P265/65R18 off-road tires. Higher trim levels come with Intellibeam headlights and larger wheels, going up to 20-inch chrome alternatives. The Silverado 1500 offers three EcoTec3 engines. The first is a 4.3-liter V6 with 285 horsepower and 305 lb-ft of torque. The second engine is a 5.3-liter V8 with 355 horsepower and 383 lb-ft of torque, and the most powerful is a 6.2-liter V8 with 420 horsepower and 460 lb-ft of torque. A six-speed automatic transmission with a tow/haul mode is standard on most models, while higher trims either offer or include an eight-speed automatic alternative. 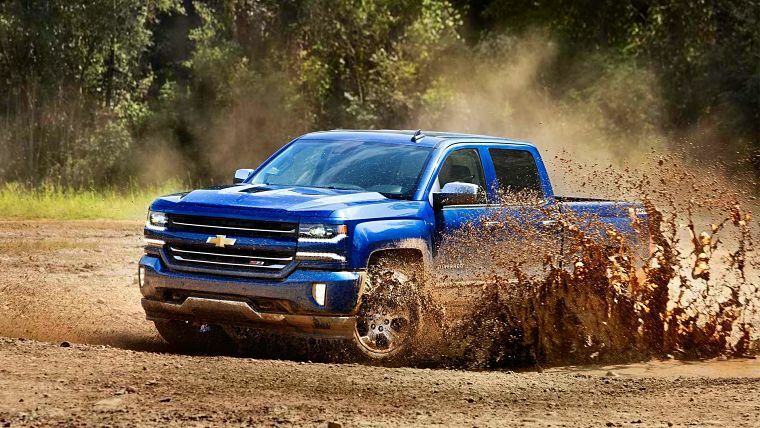 The eight-speed transmission moves the Silverado more quickly when carrying a heavy load. All 2017 Silverado models are four-wheel drive and find a good meeting point between rugged power and highway grace. Some models come with a power driver seat and power adjustable pedals to suit the driver’s seat position and height. With the stronger V8 and all relevant equipment, the 2017 Silverado has a maximum towing capacity of 12,000 lbs. and a maximum payload of 2,260 lbs. The 2017 Silverado’s cabin is remarkably quiet and roomy, even in the regular cab. Higher trim levels have everything from a heated leather steering wheel to heated and ventilated leather seats. The upgraded Chevy MyLink device streaming software now supports IO5, IO6, and Android Auto. 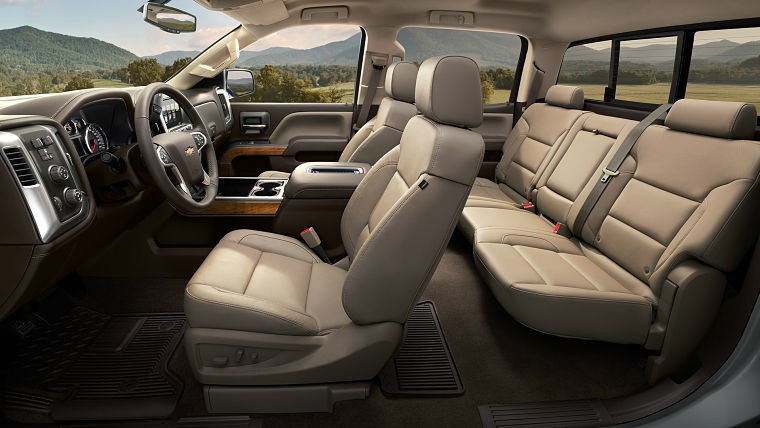 LT models and higher come with under-seat storage on all cab styles with a second row. Like other 2017 Chevy models, the Silverado 1500 now includes a teen driver mode. This system monitors speeding, volume, anti-lock brake usage, and other behaviors to show how beginners can stay safer on the road. A convenient rearview backup camera is included on the LT and higher models, instead of optional on the 2016 Silverado. Drivers who opt for the premium High Country model will get an enhanced driver alert package full of active security features, including all-new low-speed mitigation braking.